Gearing up for winter fishing means two things. The first and most important consideration is you. Dress to be warm, dry and comfortable. Dress in layers using the principle of a moisture wicking under layer, like Helly Hanson long underwear. Wear a thicker in-between layer to trap heat, like a good fleece or a heavy pair of sweat pants and wear a protective outer layer that’s primary purpose will be to break the wind, but also add some insulating qualities. With that, you’ll be covered to go out in most winter days. If you’re a die hard, you may want to consider purchasing a good quality one piece snowsuit for your outer layer. Those outfits are amazing. The second consideration is tackle. Pretty much everything you’ve used to catch fish during the fall will work ice fishing. The method of fishing is pretty much low and slow, because you’re limited to fishing right below your hole and with the cold water, you’re not likely to run into a hot, fast and furious bite. That said, the slow, deliberate presentation has convinced dozens of fish to bite my hook daily, so while I say the fish aren’t aggressive, they most certainly will take a hook and plenty do. A Sharp Ice Auger – be it manual or powered, neither will be of much use if the blades are dull. Put on sharp new blades and your ice auger will be an efficient drilling machine. It will be much easier to use and will cut holes with very little effort. That is until the ice gets two or three feet thick, then you’ll definitely start to feel it – even with sharp blades, when you cut a half dozen or more holes manually. The Ice Scoop – Little attention it paid to this inexpensive, but necessary tool. Forget it and you’ll be using your hands or possibly the blade guard on the auger to scoop the ice out. Because they can and do break, I always try to bring two. 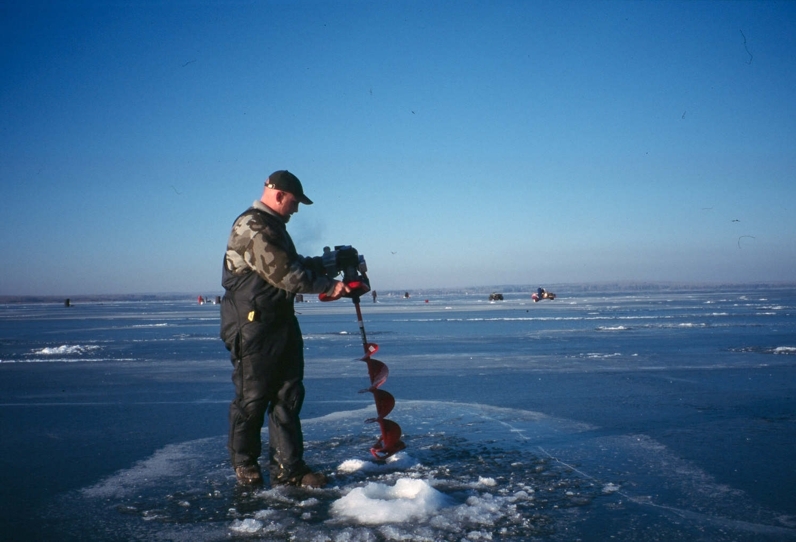 The Ice Fishing Rod and Reel – Unless you’re going to be fishing in an ice fishing tent where space is limited, the rods and reels you used during summer are going to be perfectly fine for duty on ice. The Sled – Who writes about the sled? Nobody really, but a pull sled in all its varieties is an essential tool for getting around. It makes the job of packing and moving your stuff much easier. Hooks and Line – I say you can’t go wrong fishing with bait for every gamefish, but whitefish. With the whitefish, I like to use flies, but wireworms will catch a bunch too. 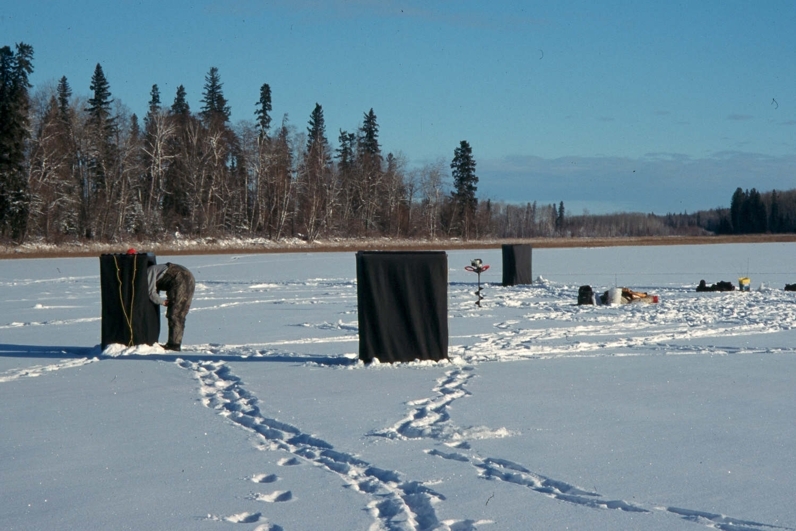 The trick to winter fishing is usually line diameter. Consider this. The ice has stopped all wave action, there isn’t a bunch of gunk floating about and as a result, the water clarity is at it’s very best. Fish can see for a mile and they can pick up a line attached to a hook far easier. For a pike, sometimes cable won’t matter, as I’ve had them bite 3/8th inch cable trying to eat the Aquaview camera it was attached to. Trout and whitefish on the other hand will run at the site of heavier line. Use as light a line as you’re comfortable with and be sure to set the drag on the reel so a fish can pull line if it gives up a good fight. You’ll avoid breaking the fish off, get a good fight and have a lot of fun in the process. It all sounds good to me.